(L-R) Paul R. Dean Alumni Awardees Kathleen Nealon (C’75, L’78), Stephen F. Arcano, Kim Askew (L’83) and Satoru Murase (L’83) with Dean William M. Treanor. 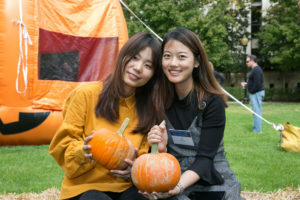 Georgetown Law celebrated in a big way at Reunion 2018: more than 1700 alumni and guests registered for events during October 19-21. Five alumni were honored for their enormous contributions to the profession. 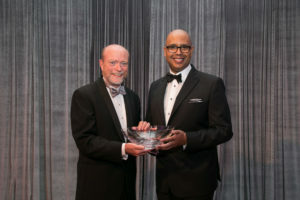 Timothy King (F’89, L’93) accepts the Drinan Public Service Award. boys’ schools in Chicago (including the nation’s first all-male charter high school) helping African American males from mostly low income families to succeed. One hundred percent of UP graduates have been admitted to four-year colleges and universities. 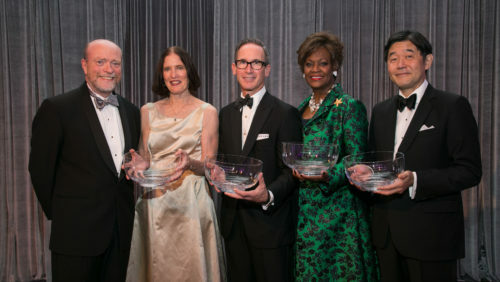 The Paul R. Dean Alumni Awards, given annually to Georgetown Law graduates exhibiting leadership to their alma mater and to the legal profession, went to Stephen F. Arcano (F’84, L’88); Kim Askew (L’83); Satoru Murase (L’83); and Kathleen Nealon (C’75, L’78). Arcano, the global head of Skadden, Arps, Slate, Meager & Flom’s transactions practices, is an adjunct professor at the Law Center and currently serves on its Board of Visitors. Askew, a partner with K&L Gates in Texas, has long been recognized as one of the country’s most outstanding lawyers in commercial litigation; she also serves on the school’s Board of Visitors. Murase is a partner in Mayer Brown’s New York office and a member of the Corporate & Securities practice; he serves on Georgetown Law’s Asian Law Alumni Advisory Board. Nealon, who has enjoyed a long career in international banking, particularly in the U.K., is a member of the European Law Alumni Advisory Board. 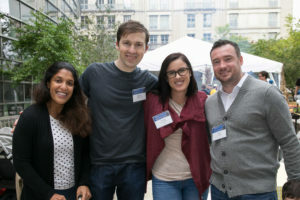 For the first time, all of the alumni awardees were selected by classmates and peers, noted David Wochner (F’96, L’02), chair of the Law Alumni Board, at the event. 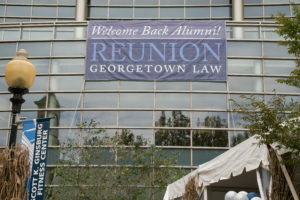 And in a video, all the honorees described how Georgetown Law built the foundation of their success. 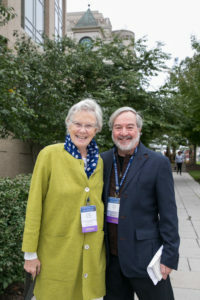 “At Georgetown, there’s just this vibe of service…” King said, noting that he was humbled to be honored with an award named for the late Father Drinan. 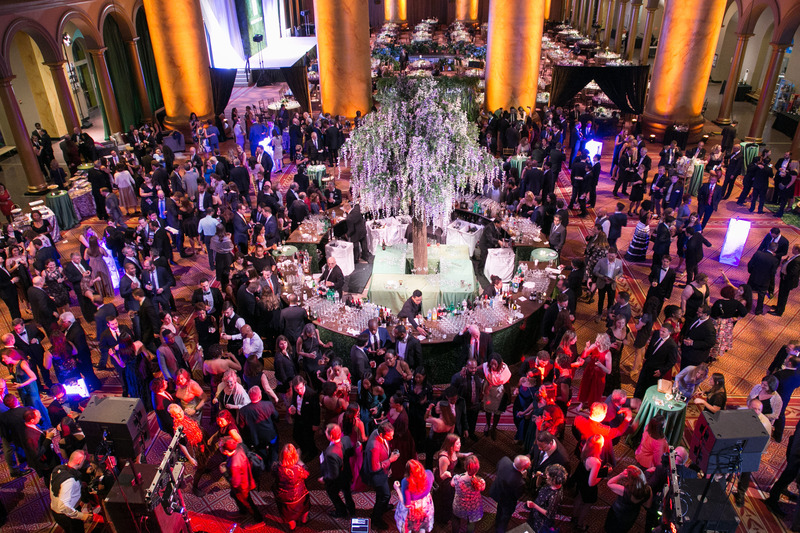 The Reunion Gala at the National Building Museum was the culmination of a week that showcased the Law Center’s most notable alumni and professors. On October 17, Dean Treanor led a conversation with James Robart (L’73) of the U.S. District Court for the Western District of Washington — who made headlines last year for blocking the first version of President Trump’s travel ban. 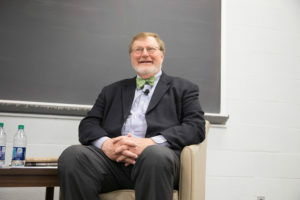 For his efforts, Robart was criticized by the president and his Twitter followers. Judge James L. Robart (L’73). Robart — who worked on the Hill for both Democrats and Republicans while a student at Georgetown Law — said that “there is a greater acknowledgment of public service these days. Friday morning began with an international flair: a conversation with Mexican Supreme Court Justices Alfredo Gutiérrez Ortiz Mena and Eduardo Medina-Mora Icaza. Professor Alvaro Santos, director of the Center for the Advancement of the Rule of Law in the Americas (CAROLA), and Visiting Professor Alicia Eli Yamin of the O’Neill Institute for National and Global Health Law guided the justices through contributions and challenges affecting the Mexican court including judicial activism, separation of powers, transparency, globalism and multiculturalism, lifetime appointments of justices (not the case in Mexico) and more. Later in the day, Professors Steve Goldblatt, Irv Gornstein and Dori Bernstein of the Supreme Court Institute lent their thoughts on the upcoming U.S. Supreme Court term. Dean Awardee Kim Askew appeared on a luncheon panel sponsored by the Women’s Legal Alliance and led by Professor Hillary Sale, who teaches a Law Center seminar on Women and Leadership, with alumnae Angeline Chen (L’96) and Latham & Watkins partner Michele Johnson (L’98). The topic? Self-advocacy. 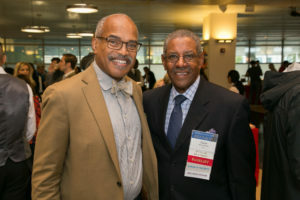 Along with many other events, Reunion 2018 also celebrated the arts — through Professor Paul Butler’s conversations with HBO’s Kary Antholis (L’88) and author George Pelecanos (hosted by GEMALaw); the Asian Pacific American Law Student Association reception with New York Times bestselling author Min Jin Lee (L’93), and museum tours. The weekend concluded with a showing of the musical “Beetlejuice” at the National Theatre. Butler had high praise for ‘The Night Of,’” the HBO series tracking a young man arrested for murder; Antholis and writers of that film came to Georgetown Law in 2016. This time, a short film called “Miss Mary’s Room,” written by Pelecanos and directed by Pelecanos’s son Nick, served as the focus for a discussion of criminal justice.